Hawaii at last has an eco friendly electric boat tour! We take you around the Harbor and Canal on our 22 foot luxury Duffy boat. 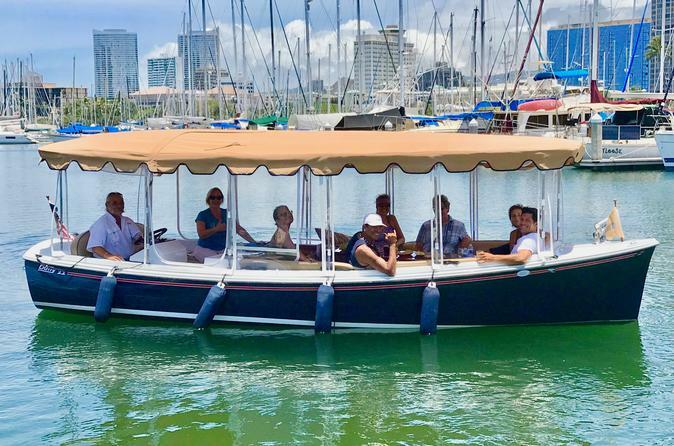 This 90 minute tour is one of the most interesting guided tours in the state of Hawaii, we give you an alternate view of Waikiki on our little boat with the big heart "Zerø"
Leaving the dock at 10.00 am or 12.30pm just behind the Harbor Masters office in the Ala Wai SBH. We proceed to silently move towards the Ala Wai Canal, passing the Waikiki Yacht club on the left. The Captain gives a guided tour under the 3 bridges (Tides permitting) past Central Waikiki on the right and the Convention Center on the left. Snacks are served and your choice of beverage including wine, beer, soft drink or water. The sight of Koko Crater looming in the background, a great unseen view of the area. Coming back past the golf course and the various Canoe clubs to the Harbor with an explanation of the interesting boats and lovely view of Diamond Head. We return back into the dock after an hour and a half of food, fun and friendship.